For the third year in a row, MSAA is conducting a Thanksgiving Card Competition! 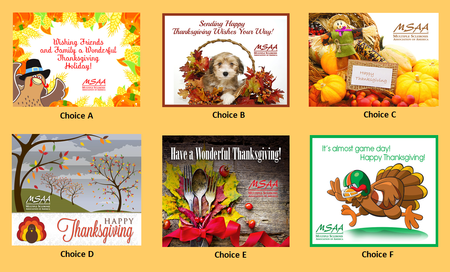 We have six online Thanksgiving Card candidates (shown below), all vying for the top spot as MSAA’s most-popular Thanksgiving Card for 2013. Please vote and then watch to see if your favorite card will emerge victorious! Once the voting is over next week and the selections are tallied, we’ll let everyone know which card is the top choice to email to friends and family, wishing everyone a Happy Thanksgiving! To vote for your favorite online card design, please visit our Thanksgiving election poll (or go to support.mymsaa.org/voteforcard). This entry was posted in Surveys and tagged ecard, holiday cards, holidays, holidays and ms, ms awareness, ms community, msaa surveys, multiple sclerosis, Multiple Sclerosis Association of America, thanksgiving, thanksgiving and ms, turkey, vote by John MSAA. Bookmark the permalink.